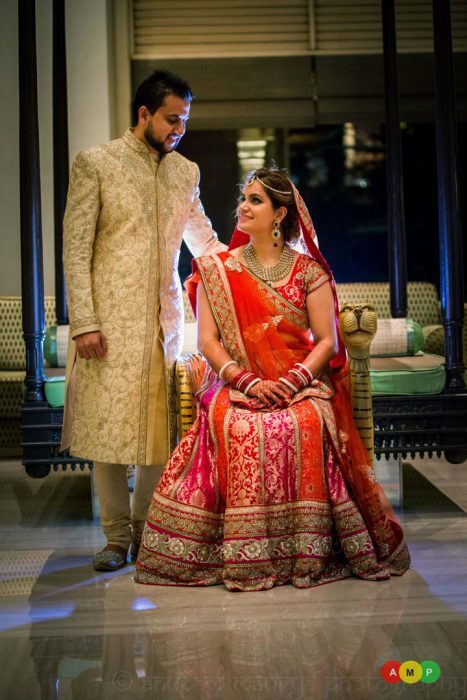 In November, 2014, Anupam received a call from Bangalore for a wedding which was just 4 days away. 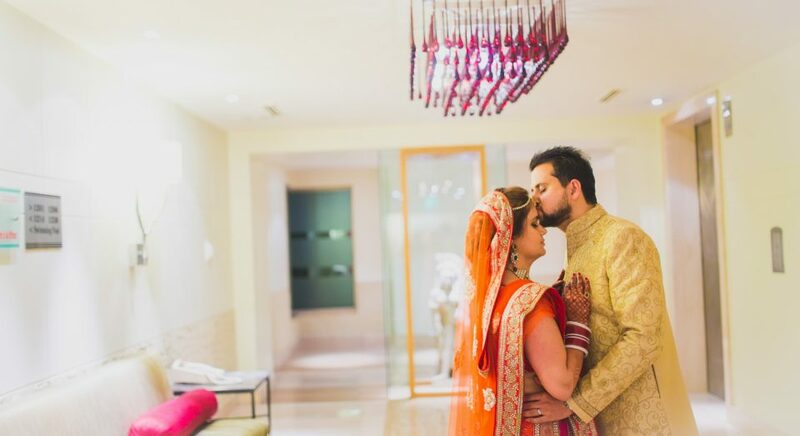 Vishal, an IT professional was going to get married to Chainika, who worked in the hospitality industry residing in U.S. Anupam started with full time wedding photography the same year and was operating single-handedly those days. “He told me that its a runaway wedding in Bangalore, which would be solemnized in a Gurudwara followed by a party at ITC Gardenia, Bangalore”, recollects Anupam. The call was enough for Anupam to make up his mind to go ahead and shoot this wedding, even though it was on a very short notice. In fact the wedding thrilled him and filled him with thoughts of excitement of his first Sikh wedding and secondly it was a run-away wedding! We humans are always fascinated when we get to do something new and out-of-the-box. A runaway wedding perfectly demonstrates that some stories do not happen in the usual way, where celebrations involve presence of family members and relatives. They are the stories of sheer determination and invincible resolve to love someone and attain them in your life, despite all the struggles, pains and hardships. As the couple belonged to different gotras, they could not receive the approval of their parents. But, when there is so much love, you get the strength automatically. So, after thousands of miles of travel, keeping up with the different time zones, sincere efforts to convince their parents and sneaking from the eyes of the rest of the world, Vishal and Chainika decided to tie the knot in a private affair, with the presence of a few close friends in Bangalore. Anupam reached on the day of the wedding catching an early morning flight and he directly made his way to Chainika’s suite at ITC Gardenia where she was getting ready. This was going to be his first interaction with her, so far Vishal was the only point of contact. She had thoughtfully chosen her wedding attire comprising of – Golden kundan neck-piece coupling them with long over-sized earrings and one-tier mang tika, a Sabyasachi Orange – Pink lehenga, chooda, kaleera ,Jimmy Choo golden heels and a three-layered payal. Her make up was subtle which made her face glow in tandem with the excitement in her heart. It was really impressive to see how Chainika took care of the little things and made sure that she followed all the customs as per a traditional Sikh wedding. Unlike most weddings, there was no rush in the make-up room of the bride. So, it ensured that the getting ready shots are captured with ease and perfection. As it can be seen in the photographs of the wedding, Anupam captured exclusive shots of the gorgeous Lehenga, the glittery golden heels, the rings and also the cheerful bride. After checking, readjusting her elements and giving the finishing touches, the bride was all set for the new journey of her life in full spirits. At the gurudwara, Vishal and a few friends were eagerly waiting for Chainika to arrive. Vishal looked suave in a beige-sherwani, red-pagdi, holding a Krijpan. 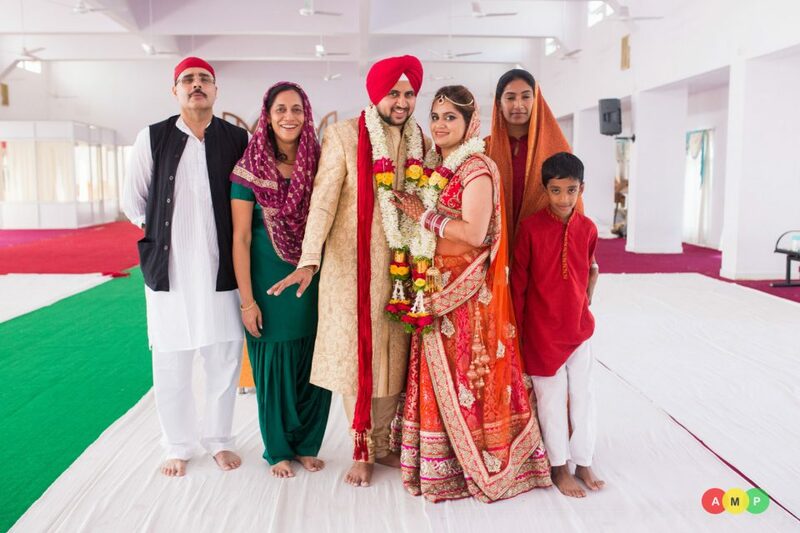 Vishal and Chainika’s wedding progressed with the kirtan, the singing of Shabads (hymns) from Granth Sahib and recitations of Ardas (humble petition or prayer). Thereafter, they took the vows. The only people present at the wedding were Vishal’s friends. They were completely lost in the sounds of the divine hymns and ardas as they stood watching Vishal and Chainika exchange marital vows. The ambience of Gurudwara was very calm and soothing. Thereafter, the newly-weds signed the documents as paperwork for the marriage registration followed by some great post-wedding shots. In the evening, the ITC Gardenia property was explored for some more amazing photographs. Now most 5-star properties don’t let you use the lobby but ITC Gardenia was like Chainika’s second home. She stayed there every time she came down to Bangalore from U.S. The entire staff knew them so well that Anupam could ask two lady staff to hold the flash lights! “This wedding will always remain etched in my mind for the warmth I received and the friends I made that day and also it being my first ever runaway wedding!” reminisces Anupam.